Noll, Mark A. 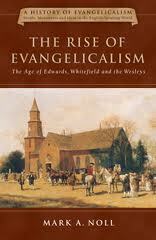 The Rise of Evangelicalism: The Age of Edwards, Whitfield, and the Wesleys. Downers Grove, IL: InterVarsity Press, 2003. 330 Pp. $28. ISBN 0-8308-2581-9. One of various authors delivering a five volume series titled A History of Evangelicalism: People, Movements, and Ideas in the English-Speaking World, Mark Noll published the first volume with his book The Rise of Evangelicalism: The Age of Edwards, Whitefield and the Wesleys. Focusing primarily on the prominent leaders from 1730’s to the 1790’s, Noll seeks to discuss the contributing factors and people that led to the rise of evangelicalism. With the skill of a seasoned author and accomplished historian, Noll sets the bar high for the series with this work suitable for use by seminarians yet still accessible for the average reader desiring to know more about this aspect of church history. As one might expect, Noll’s first order of business in his introduction is to provide a framework of common beliefs held by evangelicals from the 1730’s to this present day. Noll calls these core commitments that serve to identify a large kin network of churches, societies, books and periodicals, and personal networks that allows for both flexibility and focus in the five volume series. These familiar commitments are conversion, the Bible and the fact that all spiritual truth is found in its pages, service to God primarily through evangelism and missions, and the sufficiency of Christ’s death in providing atonement for sin (18 – 19). In his first two chapters, Noll skillfully details developments across Europe and the colonies in what became America and the movement towards what is referred to as “religion of the heart (52) while careful to note that these elements had always been present but their proliferation led directly to evangelicalism (53). Pietism, Calvinism, and High-Church Anglicanism all play roles in the development of evangelicalism and Noll spends a sufficient amount of time demonstrating how each influence is part of the character of the emerging movement. In his fifth chapter, Noll provide a critical assessment of explanations of why evangelical revivals broke out in the 1730’s and 1740’s. He argues that these explanations are only sufficient in specific situations or regions and fail to explain the overall rise of evangelicalism. Noll goes on to state that became clear is the desire for revival was more important that the actual revival itself (136 – 37). Noll also notes that the early leaders were excellent communicators and were rather young most being in their 20’s as evangelicalism developed. Noll also briefly touches on the importance of human agency in the development of evangelicalism (141 – 42). A great deal of time is spent on the development and later diversification of the movement before a rather lengthy conclusion. According to Noll, evangelicalism was never as much about changing the world as it was about changing the self or creating spiritual communities where changes people could grow in grace (262). It did not go unnoticed that more women than men were attracted to early evangelicalism. Anglicans, Moravians, Baptists and Methodists to varying degrees encouraged women to give testimony about their faith and join men in sitting in judgment on the rest (263 – 64). Noll’s generous footnotes and select bibliography is certainly a wealth of resources that should excite the serious student interested in delving deeper into this period of church history. Though scholarly, The Rise of Evangelicalism: The Age of Edwards, Whitefield and the Wesleys is an enjoyable read that should not intimidate the casual reader or layperson interested in the origins of evangelicalism specifically or church history in general. At times Noll does seem to get more focused on the ancillary historical details and key leaders when time may have been better spent giving a few paragraphs discussing the common people whose lives were changed a bit more. Still, Noll set out to focus on the leaders and events that led to the rise of evangelicalism. With that goal in mind, it is easy to conclude that Noll accomplished what he set out to do in this book. As an introduction to Noll’s work for this reader, it served to both inform and whet the appetite to explore his other works as well as the additional volumes in the series.